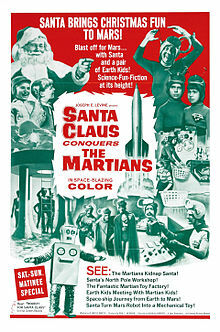 Santa Claus Conquers the Martians is a 1964 film in which Martians kidnap Santa Claus because there is nobody on Mars to give their children presents. It is considered one of the worst films ever made. Directed by Nicholas Webster. Written by Paul L. Jacobson and Glenville Mareth. All this trouble over a fat little man in a red suit! Well, when Voldar "accidentally" left us in the airlock and then came up here and "accidentally" threw the door switch, we knew we had to get out of there in a hurry or that would be the end of us. Eh, uh, "accidentally," of course. [after being asked if he is going to use a rocket sleigh] No siree! We're going out the good ol' fashioned way. Prancer and Dancer and Donder and Blitzen, and Vixen and Nixon... oh, consarnit I get those names mixed up, but the KIDS know their names. If we take them with us to Mars, Santa's disappearance will remain a mystery. No one on Earth will ever know that Santa Claus was kidnapped by Martians. You'll never get away with this, you Martian! TV News Announcer: Here's another UFO Bulletin: The Defense Department has just announced that the unidentified flying object suddenly disappeared from our radar screen. They believe the object has either disintegrated in space, or it may be a space ship from another planet which has the ability to nullify all radar beams. TV News Announcer: [News report after Santa's disappearance] And Mrs. Claus has positively identified the kidnappers as Martians. Kimar: Dropo, you are the laziest man on Mars. Why are you sleeping during working hours? Dropo: I wasn't sleeping, chief. It's just that I haven't been able to sleep these last few months. I forgot how. So I was just practicing. Betty: What are those funny things sticking out of your head? Rigna: Those are our antennae. Betty: Are you a television set? Hargo: What's soft and round and you put it on a stick and you toast it in a fire, and it's green? Kimar: I don't know what? Andy Henderson: What is this strange looking creature over here? Santa Claus: Oh, Winky made that. That's his idea of a Martian. Andy Henderson: A Martian? Wow-wee-wow! I'd hate to meet a creature like that on a dark night. Kimar: Santa, you will never return to Earth, you belong to Mars now. Kimar: How are you feeling today? Tired? Santa Claus: Oh, no, I'm not tired. But my finger is. Santa Kidnapped by the Martians! Out-of-this-world fun 'n' action...as two Earth Kids are whisked away with him to Mars! Santa Brings Christmas Fun to Mars!